Get the beautiful smile you’ve always wanted! Invisalign is the invisible way to straighten teeth using a series of custom-made, nearly undetectable aligners. Even close friends may not be able to notice you are wearing these invisible braces. And it’s been proven effective in both clinical research and in practices nationwide. So whether your teeth are crowded, too far apart or have shifted since wearing braces, you’ll have a new reason to smile with Invisalign clear braces. The latest technology makes it possible. Upon an initial examination, your doctor decides if Invisalign clear braces are right for you. Your doctor will write a treatment plan and take an impression of your teeth, which are submitted to Invisalign. Using the latest advances in 3-D computer technology, Invisialign carefully translates your doctor’s instructions into a series of precisely customized aligners. You then wear each set of aligners for about two weeks, moving your teeth, gradually—week by week, millimeter by millimeter—until you’ve achieved the intended result: straighter teeth. Generally with Invisalign clear braces, you visit your doctor no more than you would with traditional braces and the length of treatment is about the same. Call our Elizabethtown office today to learn more about Invisalign clear braces or fill out the form at the right of this page for a free cosmetic consultation. 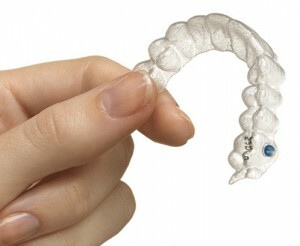 Invisalign invisible braces may be the right solution for you.